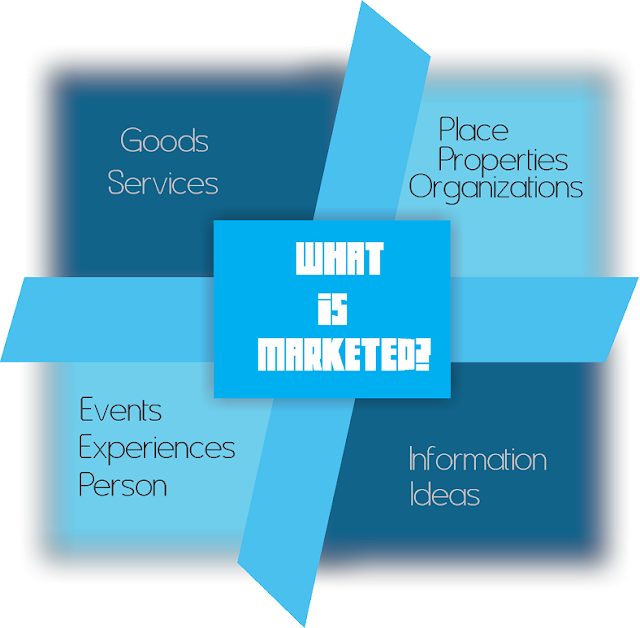 Marketing is task of creating,promoting,and delivering goods and services to consumers and businesses. In social life there is exchange of value between one person and another. Traditional marketing focus on the increasing sales but apart from this many tasks performs. Marketing is multi focused based science.There is many objectives of a marketers.In the marketing,The marketer not only market the goods and services. There are many other things that is in the scope of marketing. Insurance,Catering,Health care,Business process Outsourcing,security,Financial services Etc. Incredible India,Tourism,Australia Tourism,Malaysia Tourism etc. Olympics,Rann utsav,Film festivals,Fashion shows,Concerts,Horse races etc.